The health benefits of soy are well documented. The latest Vegetarian Times says that women who include soy in their diets are less likely to develop breast cancer, and might reduce the risk of fibroids. The weaker phytoestrogens in soy compete with the harmful estrogen in a woman’s body, effectively blocking the “docking” of these estrogens that can lead to cancer. So why not throw some tofu on the barbie? This recipe for North Vietnamese tofu brochettes originally included fish, but as I’ve often said, anything you can do with fish, I can do with tofu. The basting sauce, made with dill and green onions, was delicious, just the thing for a warm spring day. While the tofu is marinating, I highly recommend taking a 6 mile hike, to increase your health benefits even more. I served this with saffron rice and stir fried green beans with hoisin sauce and almonds. 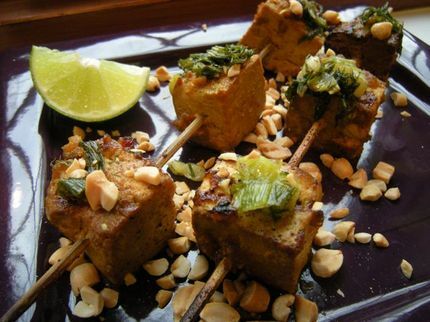 Peek below to find out how to make North Vietnamese Tofu Brochettes. Combine the grated onion, garlic, ginger and chile in a bowl. Add the turmeric, three tablespoons of the oil, the tamari/soy sauce, and the mirin. Stir to combine, then add the torfu. Marinate in the refrigerator for 2-3 hours or overnight. To make the basting sauce, heat 3 tablespoons of oil in a sauce pan, and add the scallions and dill. Saute for 2 minutes. Remove from the heat. Add the tofu to the skewers, about 3 pieces to each skewer (unless you are using short cocktail skewers, then you could put on one each skewer.) Season with salt and black pepper. Grill the brochettes on the grikll for 5-7 minutes on each side, basting with the basting sauce. Remove to a platter, scatter the peanuts on top and serve with lime wedges.